The Barber Dam Hydroelectric Project is the closest hydroelectric power plant to Idaho’s capitol. It’s located about 1/3 mile above Eckert Road east of downtown Boise. Fulcrum, LLC, a subsidiary of Enel Green Power North America, Inc., and Ada County are co-licensees. The 40-year Federal Energy Regulatory Commission (FERC) license for the project, #4881, expires on November 30, 2023. Fulcrum, LLC and Ada County have filed a Notice of Intent and Pre-Application Document (PAD) to relicense the 3.7-megawatt project. The initial licensing of this project in 1983 happened at a time when few people paid attention to the small project on the Boise River or the mill pond behind Barber Dam. Times have changed. Relicensing is an opportunity for anyone with interest in the natural or cultural resources affected by the project. Everyone is welcome to come to the relicensing table and get involved in how the project will be operated in the future. 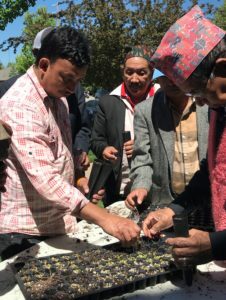 BREN has hosted two public programs on project relicensing. Watch the videos. On February 1, John Falk from the Idaho Department of Water Resources Dam Safety Program shared historic information and amazing historic photos of the Barber Dam itself. Massive logs were floated on a much higher Barber Pool and processed in sawmills on site. Those sawmills were initially powered by water, and then after generation was installed, they were powered by electricity. There is a long and rich history of industry at the dam and around the pool which is challenging to keep in perspective when you’re birding on the pool. The story of how Barber Dam became a licensed hydropower project is interesting. This history and much more is laid out in the PAD. This portion of the Boise River is one of the lesser known portions because access is limited. Much of the property surrounding the pool is owned by the Idaho Foundation for Parks and Lands and operated as a conservation area for birds and wildlife. BREN is hosting a program about Barber Pool on April 5, at 11:30 at the Boise Library Hays Auditorium. Speakers will talk about the aquatic and terrestrial resources and management. The Greenbelt on the north side runs next to Warm Springs Blvd, and on the south side it’s up on the rim going through the subdivision. It’s a hike to get to the river near the Hwy 21 bridge and the dam itself is an impediment. To safely bypass it you must exit the river and walk around the dam on the north side on a small path provided by the project – the only portage provided around any dam on the Boise River. The FERC process for relicensing this project is kicking off with a meeting and site visit facilitated by Fulcrum LLC and Ada County on March 21. Members of the community can attend to learn about the project, ask questions and voice concerns. The public can suggest studies the applicants should conduct to help determine appropriate mitigation. Please consider becoming part of this process which will impact the Boise River for decades to come. 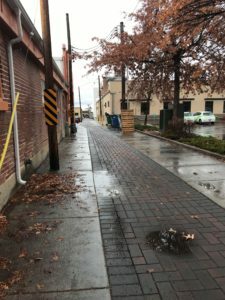 It must have been a dry July when the City of Boise founders platted the first streets in 1863. They established the city in the channel of Cottonwood Creek. Although Cottonwood Creek is a large tributary to the lower Boise River, it can dry up for months between rain storms and snow melt. The natural course of Cottonwood Creek was down what became 5th Street, across Main, Grove, and Front streets and then across Tom Davis’ orchard, (now Julia Davis Park), to the Boise River. It wasn’t long before city residents learned what it meant to live in the path of Cottonwood Creek. See part 1 of this series. In 1881, after years of repeated flooding, the Boise City Council paid for construction of a flume to route Cottonwood Creek through Fort Boise to the Boise River. The route of the flume is shown below on the excerpt of an 1885 map. A section at Fort Boise was built in stone and remains standing today. According to the Idaho Tri-Weekly Statesman, the “flume seems to answer all purposes.” But this wasn’t to be the case. Cottonwood Creek carried more than water from the foothills to the valley – tremendous quantities of sand and gravel also were swept downstream with summer thunderstorms and spring freshets. The sand rapidly filled the flume causing the water to overflow and take out the flume walls. Crews of men were tasked with regularly digging out the sand. Sand also filled irrigation ditches that had been built across the creek’s path causing much complaint from the owners. After more flooding in May 1892, the Boise City Council voted in September of that year to replace the primarily wooden flume with a stone aqueduct. The new flume was built with sandstone blocks from the foothills quarry. It was built in a V-shape and back-filled with sand at a cost of $9,000. The V-shape can be seen today in this section of the flume at Flume Ct.
A new mayor, Peter Sonna, was sworn in on July 15, 1893. According to the Idaho Daily Statesman, Mayor Sonna personally supervised repair work on the flume in October of that year. A new rock wall was built, and concrete was poured into the gap between the flume and the wall. The outside of the flume may have been more secure, but the inside of the flume still filled with sand, and, as a consequence, Cottonwood Creek overtopped and broke the flume and flooded the new East Side Addition neighborhood in March 1894. Mayor Sonna, relieved the water was flowing east and not west down Main St., delayed repair work until the high flows had ended. 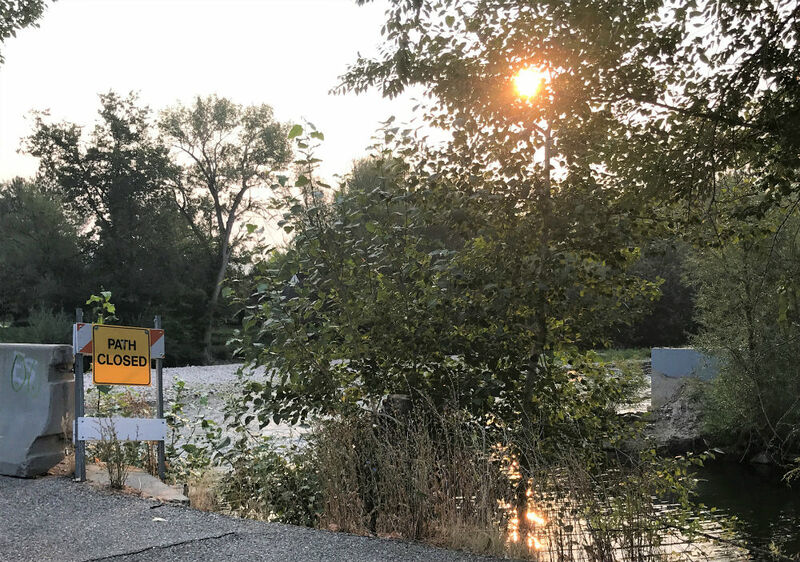 The flume was filled with three feet of sand, and yards throughout the neighborhoods were “washed full of sand,” according to the Idaho Daily Statesman. Emergency repairs were made to the Cottonwood flume year after year after year. The city continued to develop and more houses were built in the East Side Addition and in the Central Addition. The population grew to 5,957 by 1900. Then came March of 1904, when 2.46 inches of rain fell in 24 hours. Part 2 of a blog series exploring the history of Cottonwood Creek. Made possible by the Idaho Fish and Wildlife Foundation and the Boise River Enhancement Network. The Juncos are feeding at first light. I grab the binos from the dresser. Mourning Doves come and flutter their wings. Bundled for the cold, but happy to the core. I know it’s him though I cannot see. While a group of Crows decide who’s boss. While Ruby Crowned Kinglets look like toys. They gather in numbers that look like herds. Plus both kinds of Mergansers, then a Heron flies by. Every time I see him it gives me a shiver. Who wouldn’t have noticed him though he sits so tall. While down in the brush the Wren seems to tattle. Though often to a Kestrel he must yield. And Common Goldeneye are a sight to see. And sometimes a Merlin appears from afar. Though often when they see me, they fly away. Hoping to find one that no one has found. Although I never go out whenever it’s snowing. Watching birds and making rhymes. The east end of Julia Davis Park in downtown Boise will be transformed over the next year. What’s now a mono-culture of turf with scattered mature trees will make way for a vibrant small creek with aquatic and riparian vegetation taking root. 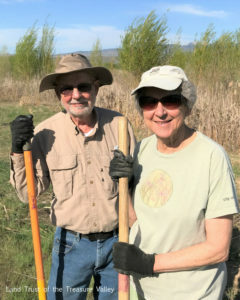 Willows, Wood’s Rose, Golden Currant, Red-osier Dogwood and other native plants will grow on the banks of the new Cottonwood Creek and provide habitat for resident and migratory birds. Read about the Cottonwood Creek Daylighting Project. Without knowing what birds frequent the park now, it will be hard to measure the impacts of the project. 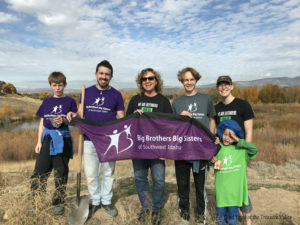 To answer this question, BREN and project partner the BSU Intermountain Bird Observatory turned to local birders. 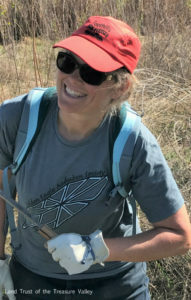 In an example of citizen science at its best, local birders have been enlisted via eBird to document what they find when they go birding at the project site. Eight dedicated birders have submitted eBird checklists for the Cottonwood Creek Daylighting Project so far. It’s exciting to see the power of citizen science at work, collecting pre-construction data on this project. 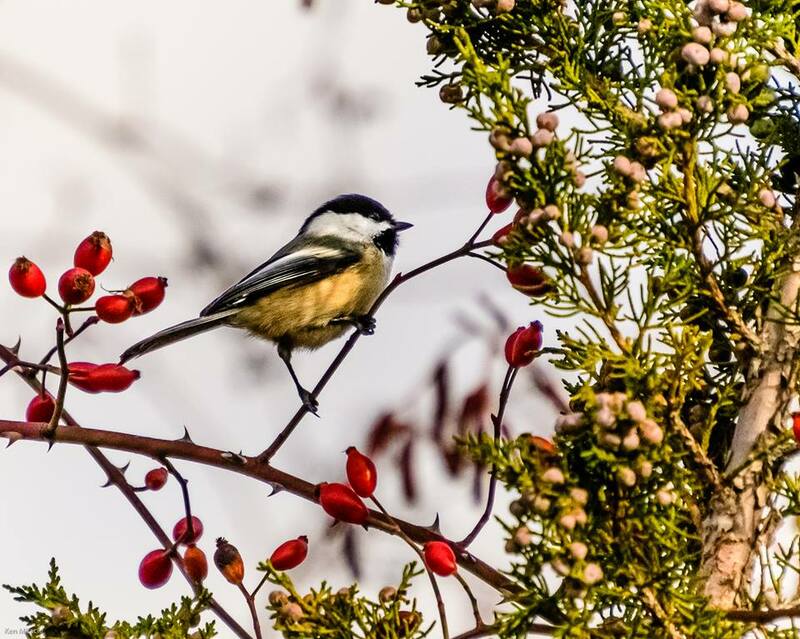 All together, our volunteers have done the equivalent of eighteen in depth bird surveys by submitting complete eBird checklists of every bird they identified in the area. Canada Geese are the only species that has been detected on all 18 surveys! But this isn’t surprising, since the future location of Cottonwood Creek is currently grass….which just happens to be their favorite food! 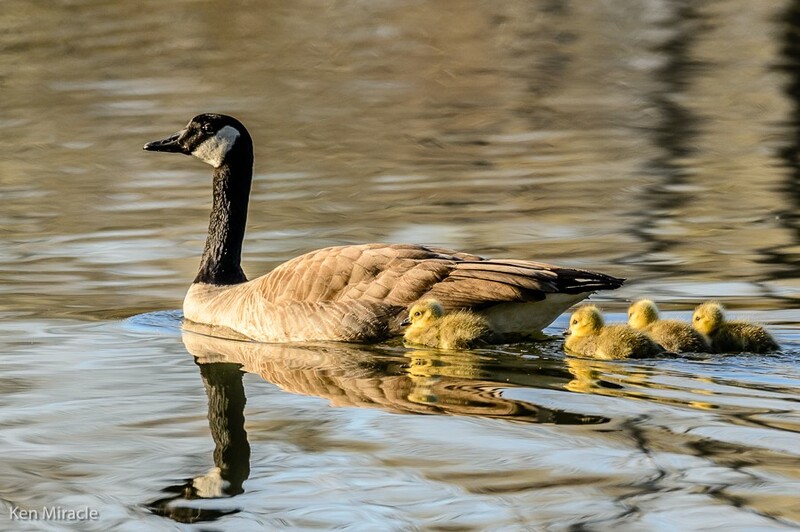 Canada Geese are likely one of the only species that won’t love the Cottonwood Creek Project. They like wide open spaces (with no cover for potential predators to hide in) and green grass. As we add native shrubs and plants, we expect Canada Geese to visit this area less often…..hooray for less goose poop! The Song Sparrow is a nondescript passerine bird and not much to look at, but it has a beautiful song! Song Sparrows are a species that nests in low dense vegetation near waterways. 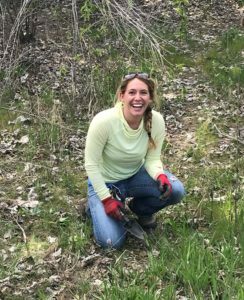 The new plantings we will do as part of the Cottonwood Creek project will provide fantastic nesting habitat for Song Sparrows within just a few years! It won’t take long to get native habitat established that Song Sparrows will love to use! Yellow-rumped Warblers are a migratory species that visits the Treasure Valley during spring and fall migration, as well as the winter. For migrating birds, it’s not just about nesting habitat. They need to have good habitat in both their summer and winter grounds! By restoring Cottonwood Creek, we would ensure that the Yellow-rumped Warblers that visit us have a place to call home while they are here. 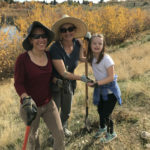 Do you want to get out and see what the Cottonwood Creek Project is all about? Visit this link to learn more about how you can contribute. https://docs.google.com/document/d/1Lz7Mc2-JFNS64_RrLVFVsEFZ62aOcB2OLI9mxIgqvdg/edit# We are excited to watch the data and bird sightings change over time as this project moves forward, and we hope you’ll join us! Luckily for the approximately 800 people that lived in Boise in 1866, the floodwaters were kept out of most of the Main St. cellars. 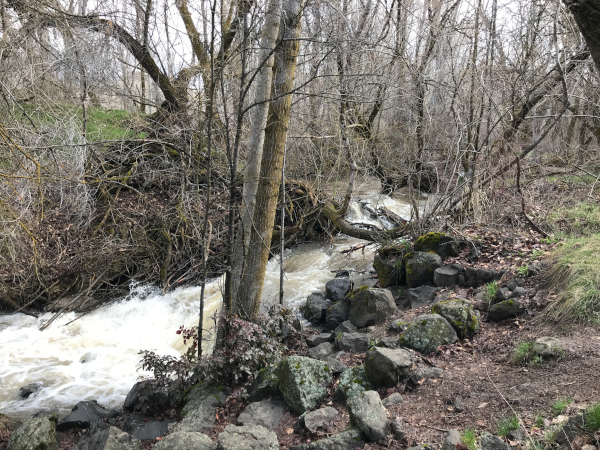 But Cottonwood Creek continued to be a “great source of trouble and expense.” Winter rain-on-snow storms, spring freshets, and heavy summer downpours caused the creek to rise precipitously and follow the path of least resistance down 6th Street to Main Street to the Boise River. In July 1863, the U.S. Army established Fort Boise on a slight rise overlooking Cottonwood Creek. It appears that the nation’s river experts, the Army Corps of Engineers, were busy elsewhere and did not participate in the decision on where to locate the Fort. The low-lying part of the Fort was built in the path of Cottonwood Creek. Not long after this, in August 1863, Boise City founders laid out a townsite about a half-mile away. The initial plat was for ten blocks on each side of Main Street between 5th Street and 10th Street. Fort Boise and Cottonwood Creek were thought to be a good distance away, but actually the channel of the creek cut diagonally through the townsite. During the periods when the creek flow was low or non-existent there were no problems, but when the waters rose, Cottonwood Creek made a beeline for Main Street. So began an expensive battle against the floodwaters and this battle continues to the present day. Fort Boise is in the foreground of this historic drawing. The Cottonwood Creek channel can be seen. Cottonwood Creek is the largest tributary to the lower Boise River. It drains an 8,000‐acre watershed of the Boise Front, northeast of downtown Boise. The headwaters of Cottonwood Creek are at 5,600 feet elevation, nearly 3,000 feet above Fort Boise. The watershed was heavily grazed in the late 1800’s and many mines were dug in the upper reaches. By 1881, the population of Boise had more than doubled and the battle with Cottonwood Creek escalated. Cottonwood Creek continued to flow through the eastern part of Boise well into March 1881. On July 30, 1881 the Idaho Tri-Weekly Statesman editor wrote, “This creek has been a great source of trouble and expense to Boise City.” The City Council was moved to action. On September 22, 1881 an advertisement appeared in the Idaho Tri-Weekly Statesman stating the City was accepting bids for the construction of a stone flume on Cottonwood Creek. Part I of a blog series exploring the history of Cottonwood Creek. Made possible by the Idaho Fish and Wildlife Foundation and the Boise River Enhancement Network. 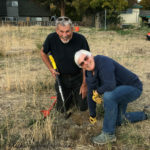 The Boise River Enhancement Network is a partner in a cooperative project to ‘daylight’ Cottonwood Creek where it flows through Julia Davis Park and enters the Boise River. The creek currently runs through a stone flume under the park. 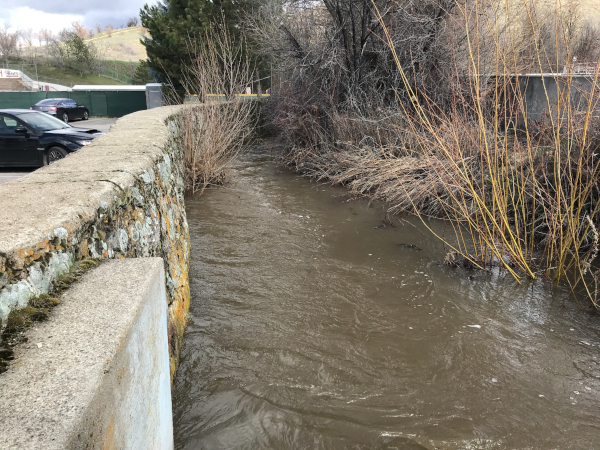 A new open creek channel will be constructed for the creek benefiting fish and wildlife, water quality and park visitors, and the flume will be ‘retired.’ The project leads are City of Boise and Trout Unlimited. 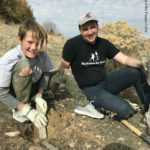 Partners include the Intermountain Bird Observatory, Ada County Highway District, Golden Eagle Audubon Society, and Land Trust of the Treasure Valley. 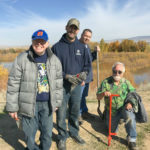 The project is funded, in part, by the US Bureau of Reclamation, the City of Boise Open Space and Clean Water Fund, and the Idaho Fish and Wildlife Foundation. 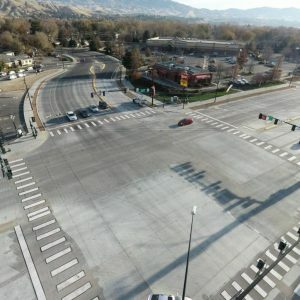 After what seemed like an eternity of disrupted traffic for State St. commuters, the new State St. and Veterans Memorial Parkway intersection is finished. Congratulate yourself if you’ve figured out how to negotiate the turn lanes. From the perspective of the Boise River, the inconvenience was well worth it. Improvements in stormwater management make this $8 million Ada County Highway District (ACHD) project a big win for fish and aquatic health. 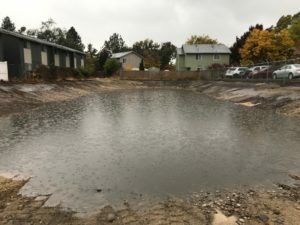 New stormwater facilities have replaced the pipes that carried pollutant-laden water directly from State St., 36th St. and Veterans Memorial Parkway to the Boise River for decades. A combination of seepage beds, bioswales and stormwater basins now capture runoff from nearly 30 acres. From Whitewater Blvd. 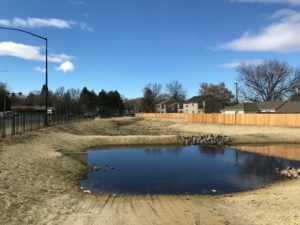 on the east to just beyond Arthur St. on the west and from Anderson St. on the north to N. Stilson Road on the south, stormwater is now captured and infiltrated into the ground improving water quality in the Boise River. A basin on the south side of State St. captures stormwater from 3 acres west of the intersection. A large basin with a forebay located on the west side of Veterans Memorial Parkway captures stormwater from most of the project area – 26.75 acres. Two small basins collect neighborhood stormwater at the Glendale St. and Alameda St. cul-de-sacs. 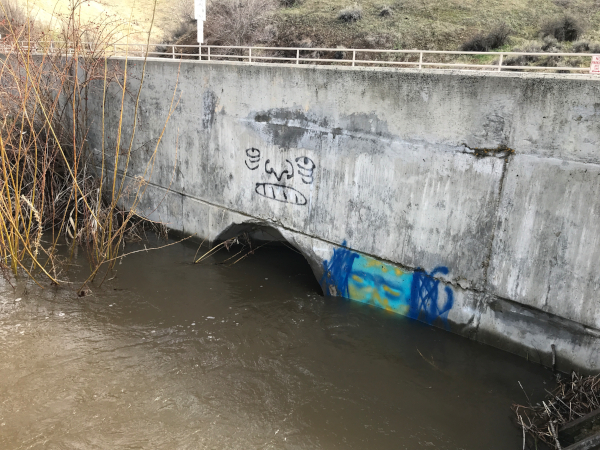 While ACHD, Boise and Garden City have not permitted new buildings and roads to discharge stormwater to the Boise River for decades, stormwater from hundreds of miles of roads still travels through pipes to the Boise River. 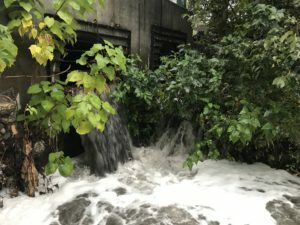 Stormwater washes pollutants off roadways, and sediment, bacteria, nutrients, oil, grease, heavy metals and trash are flushed into the Boise River. The Boise River Enhancement Plan recommends use of green stormwater infrastructure like these basins to treat stormwater onsite. Portions of the Boise River do not meet water quality standards established by the Idaho Department of Environmental Quality. 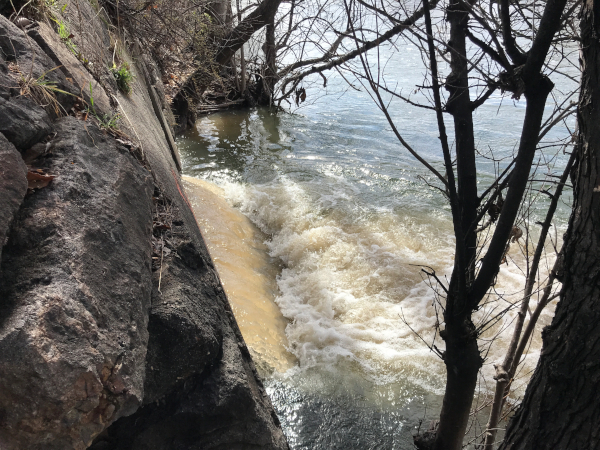 The levels of sediment, bacteria and phosphorus in the river harm fish and other aquatic organisms and have a negative impact on recreation. Discharge of untreated stormwater water to the river is one source of these pollutants. All of the water you see in the stormwater basins is water that used to dump directly into the river by Veterans Memorial Parkway bridge. Wow! Is That a Stormwater Basin? ACHD stormwater detention facilities have traditionally been very utilitarian. A big dirt basin surrounded by a chain link fence is a common look. ACHD made a major shift in 2017 by adopting new policies that require stormwater basins be vegetated. Vegetation improves the aesthetics of the basins and the plants uptake pollutants and provide habitat for birds and pollinators. 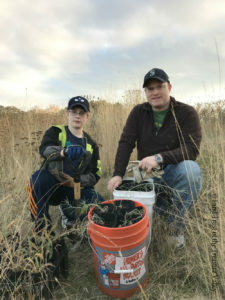 The stormwater basins on State St. and Veterans Memorial Parkway have been seeded with native wetland and dryland plants including perennial bunchgrasses, sedges, and bulrush. A temporary irrigation system has been installed at the Veterans Memorial Pond to help the plants become established. 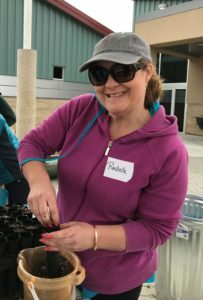 ACHD has built many green stormwater facilities in recent years including permeable pavers in downtown alleys, and bio-retention planters at 15th and State St. and on Capitol Blvd. Large transportation and redevelopment projects are underway across the Treasure Valley. Stormwater from these projects must be retained onsite. Water quality will continue to improve as more and more stormwater is treated onsite. Keep that in mind next time you’re stuck in a construction-related traffic jam. We asked for your help, and you stepped up big time! Thanks to the generosity of you and your neighbors, the Plantation Island Greenbelt bridge and pathway will soon be restored. 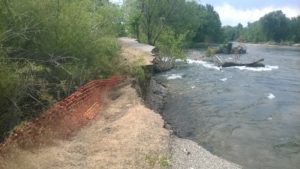 Just last month we, the Idaho Foundation for Parks and Lands, spread the word that we needed your help to repair the Plantation Island bridge that had spanned the beloved Greenbelt. And you listened! We shared that we had received partial funding for the repairs from the Federal Emergency Management Agency (FEMA). We called on you to help us raise the extra $75,000 needed to get us across the finish line. You did it! As of today we have raised the funds and are gearing up to get the bridge back in action! We could not have done it without you. Thank you! 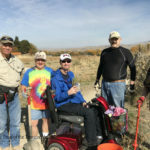 Special thanks to Foundation for Ada and Canyon County Trail Systems, Linda Yanke, Don and Kay McCarter, and Citizens for an Open Greenbelt for their generous gifts, and to all of you in the community who gave gifts of all sizes! Thanks as well to all the individuals, businesses and organizations that helped spread the word. 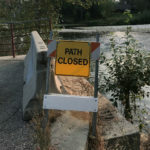 Have you asked yourself, “When in the heck is the Greenbelt over the Boise River near the Plantation Golf Course going to be fixed?” Well, you are not alone! The west bridge at Plantation Island was located on land owned by the Idaho Foundation for Parks and Lands (IFPL), a public benefit nonprofit corporation. 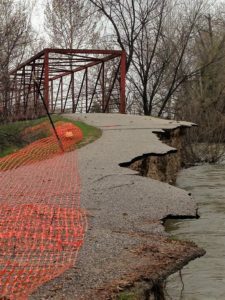 During the high water in 2017, the City of Boise, Ada County and the Ada County Highway District paid for the removal of the bridge because the bank was eroding around the bridge abutments. The undamaged bridge was lifted off its abutments by a crane on April 3, 2017 and put down near the Western Idaho Fairgrounds, where it sits today. The bank loss and Greenbelt damage on Plantation Island from the extended record-breaking flow of the Boise River was extensive. 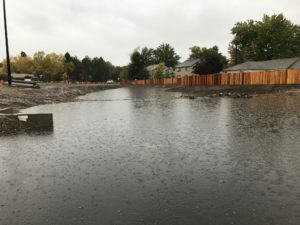 Governor Otter declared a flood emergency for Ada County that allowed IFPL to apply for funding from the Federal Emergency Management Agency (FEMA) to help with repair costs. Unfortunately, hurricanes and massive forest fires across the nation stretched FEMA resources thin, delaying funding approval for more than a year. Finally, in late June 2018, IFPL received approval from FEMA for partial funding to make the necessary repairs and replace the the bridge. Hoorah! The total repair costs are estimated at $200,000 and FEMA has granted IFPL $120,000. IFPL must now raise at least $75,000. Between now and October, IFPL is fundraising to secure the needed funds. Everyone is asked to pitch in to restore this important bridge between the south and north sides of the river. Commuters use this route as do children going to school, people going to the fairgrounds, Hawks Stadium, Garden City Library, and many other destinations. Plantation Island is also a great place to birdwatch, walk your dog or go fishing. The Foundation aims to raise the money in the next few months so the work can be done when the Boise River is at low winter flow levels. Help Idaho Foundation for Parks and Lands restore the beloved Plantation Island Greenbelt Bridge. Time is of the essence. Donate now. Thank you! The west bridge to Plantation Island has been gone since April, 2017. The Pintail Ranch straddles the Boise River near the Highway 95 bridge by Parma, ID. Doug Bates bought the the beautiful property, in part, to create and improve wildlife habitat on the ranch. Little did he know what was happening on his ranch was harming the fish and wildlife that live in the Boise River. Being a man with a strong stewardship ethic, Mr. Bates has decided to tackle this problem. 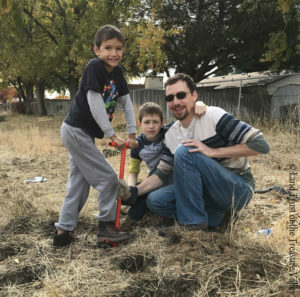 He’s beginning a phased conversion to a new irrigation system that will prevent tons of sediment from entering the Boise River each year. Corn is the primary crop at the 1,000-acre ranch, but there are large sections of ground kept in pasture and grazed by cattle. The row crop land has been irrigated for decades by either pumping or gravity feeding water from the Boise River down long corrugates after which the excess water returns to the river. Water is delivered to the pastures in the same manner, but the water spreads across the pasture and then returns to the river. This method of irrigation tends to be inefficient, requiring more water to be delivered than the plants can use. This is because fields aren’t flat and additional water has to be dispersed over the ground to irrigate the high spots. 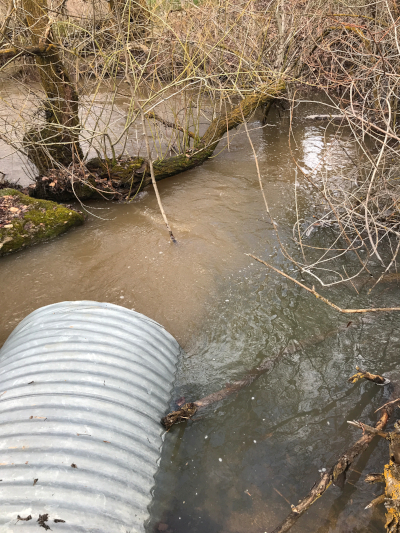 As the water flows through the fields it collects sediment, pesticides, chemicals, fertilizer, and phosphates and carries these substances into the Boise River. The moving water also erodes the river bank and field bottoms. Slag pools form at the bottom of the fields and the cattle tend to wallow there. Cattle actively graze irrigated pastures, also. Contaminants from cattle excrement are carried to the river in the irrigation run off. The Pintail Ranch has summer irrigation water rights of approximately 46 cubic feet per second. This equates to the delivery of several million gallons of return water (accompanied by chemicals, fertilizers, and sediment) to the Boise River every 24 hours when the ranch is in full summer irrigation mode. Mr. Bates is installing pivot sprinkler irrigation on four fields totaling 162.5 acres. 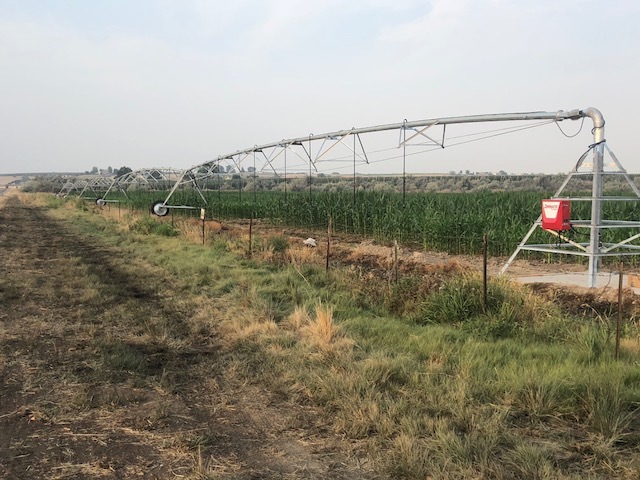 Pivots are more efficient and can irrigate the same acres with less water than needed in traditional flood and ditch irrigation. 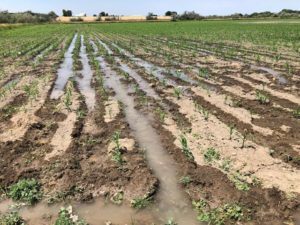 Field runoff is nearly eliminated, and chemicals, sediments, and fertilizers stay on the ground promoting crop growth instead of being dumped into the river. As a result, tons of sediment, along with with phosphorus and other pollutants from these fields will no longer enter the Boise River each year. The challenge with pivots should be no surprise; they are very expensive. 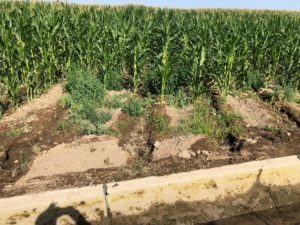 Mr. Bates received assistance from the Natural Resources Conservation Service and Canyon Soil and Water Conservation District in Caldwell to design the new irrigation system. 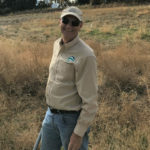 In July, the Lower Boise Watershed Council and Canyon Soil and Water Conservation District awarded Pintail Ranch 50% of the project cost, $187,500, from the 2018 State Agricultural BMP Implementation fund. Phases 1 and 2 have started and are expected to be completed in the spring of 2019. Agricultural best management practices, including conversion to sprinkler irrigation, are recommended in the Boise River Enhancement Plan. Managing pollution on-site is the best way to improve water quality. 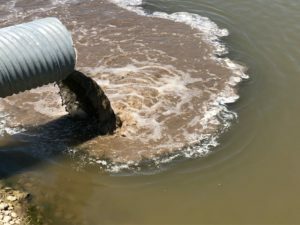 Conversion from flood to sprinkler irrigation has been proven to be effective in reducing the movement of sediment and pollutants from the field to the river. All photos provided by Doug Bates.